We all know – or think we know – that Smart Cities are driven by Smart Technologies, but what about the people? In much the same way as industries hype their products (Broadband, Superfast Broadband, Ultrafast . . .) so it is with entire cities. 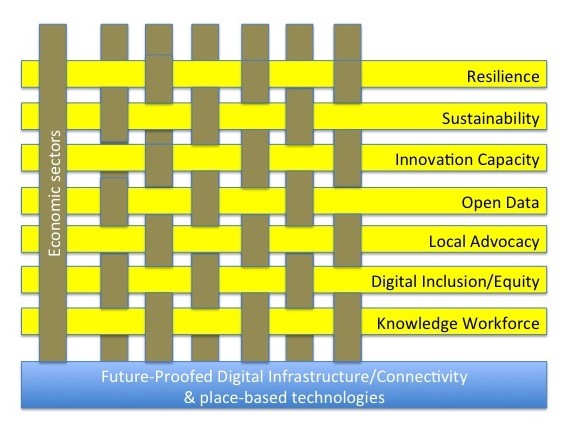 Beyond Smart Cities we have Social Smart Cities (tackling poverty), Green Cities (very Circular), Resilient Cities (prepared for the unexpected) and even Compassionate Cities – caring about digital inequity and boosting Inclusion. And whilst the ‘smart tech’ systems and infrastructures are key to enabling all these variants there is still the human element – the citizens and their business that must live work and play in these communities. All the place-based systems in the world still need to serve the citizen – not the other way around. So enter, stage left, the ‘Intelligent Community’ with its fabric woven from all the usual economic sector metrics and demographics plus the threads of social wellbeing policies. The question is: Is your city ready? You may be contemplating an impressive array of investment proposals to deal with Transport, Air Quality, Housing, Social Care – the list goes on – but will all those plans knit together to match your citizens’ and community needs? One way of finding out – free of charge – is to nominate your community for assessment by the Intelligent Community Forum. Who knows, you may even be selected as one of the world’s Top 21 or Top 7 Intelligent Communities. Melbourne, Australia, went on this year to be acclaimed as the Intelligent City of the Year. That achievement was announced in New York at the ICF Global Summit last June. Next year’s great event (with mayors, civic leaders and community developers from across the world) will be in June, in London – the first time in two decades that this very special occasion will be held outside of North America. You could be there – and your community could find its place on the global stage. ← Common Ground: the strength of local leadership. Whilst the idea of selecting cities is a convenient way to compare societies with large populations; that seems to miss smaller towns and perhaps more importantly the UK’s VITAL bread baskets. A really shining example is the small Traddock hotel in Austwick which has benefitted from the astonishing success generated by all the local volunteers helping B4RN install true SYMMETRIC 1 Gbps hyperfast broadband throughout their areas. Couldn’t agree more, Walter – which is why the Intelligent Community Forum is about communities regardless of size. This blog focuses on Cities simple because I want to encourage them to apply and in that cause we’ve partnered with the Centre for Cities. Future messages will be shaped for smaller communities and there’s no denying the power of locally concerted effort. Whether it’s in Batley, Grenfell or Manchester, recent examples of community endeavour have been a response to unexpected disasters – but we shouldn’t have to wait for lightning to strike before community spirit is developed. By the way, there’s a B4RN example (put forward by Yorkshire Dales National Park) in the Finals of the NextGen Digital Challenge – Place-Making Award. This is a new Awards category this year with emphasis on projects designed to bolster local communities.